It doesn’t matter where you are in Italy. There are views and eye-catching sights everywhere. You can be in a big city looking at a famous monument, on a small street, looking at a small city high up on a mountain, at the beach, climbing stairs or sitting at a small trattoria. Italy is all about its architecture. It has a personality all to itself. Here you stand on ancient roads, some dating pre-Roman. You feel and see its history. At the same time there is a modern culture all around you. iPhones, iPad and computers are everywhere. Most bars have free wi-fi service. We come to Italy for the food, the people and these views. I love the feeling of being in an ancient place. Thinking about those ancient people and what they did, what they felt. Was their life that different from ours? These views can talk to you! Just listen and hear what they are saying. This is not a country to be rushed. Stop, relax and take in these views. Listen to them. Imaging yourself back in those times. Soon your modern problems give way to an appreciation of this great history. My wish to all my readers is to be able to travel. experience another culture. Enjoy life more. There is so much to experience and learn. Pick a place you are passionate about and visit it. Put it on your bucket list. life is short but memories are forever. My passion is Italy, what is yours? 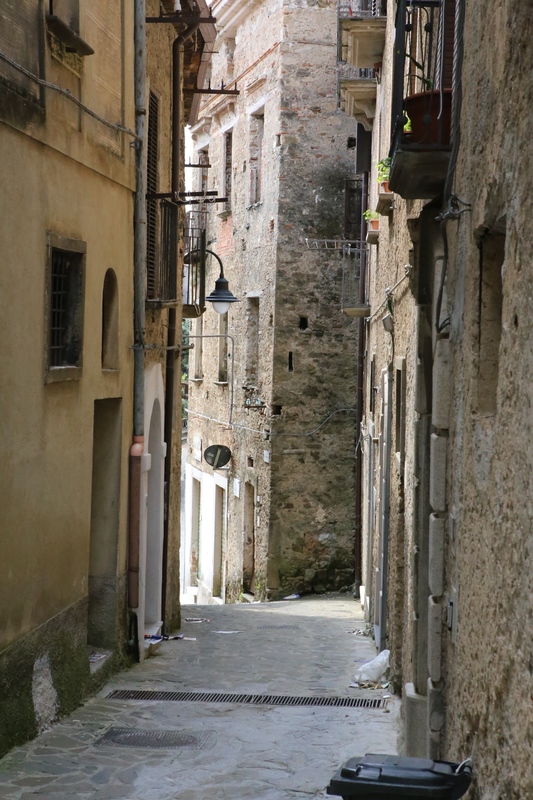 Big cities or small, Italy has interesting streets. I love walking the small streets as they wind through a city. Some are pedestrian only which means people and scooters, Scooters are everywhere in Italy. It is a way of life. 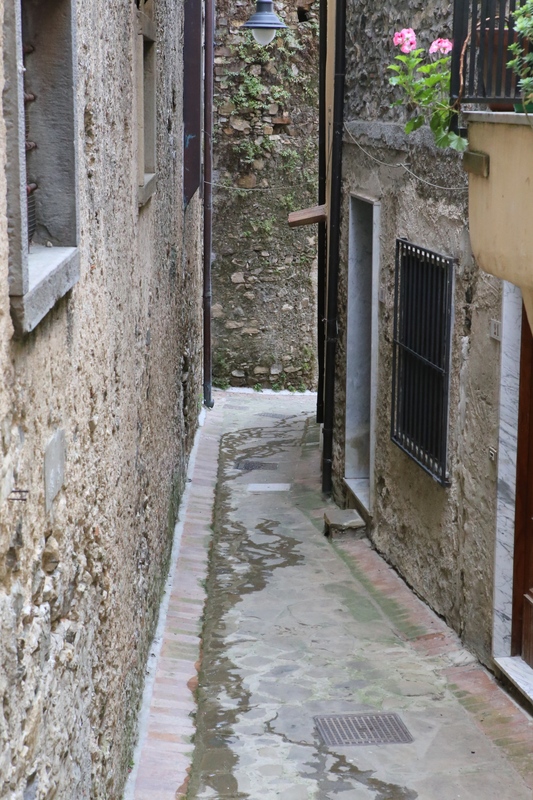 As you walk along a small street, especially in a small town, you see other small streets off to the left or right. Some curve and disappear out of sight. Others are steep or turn into a set of stairs. 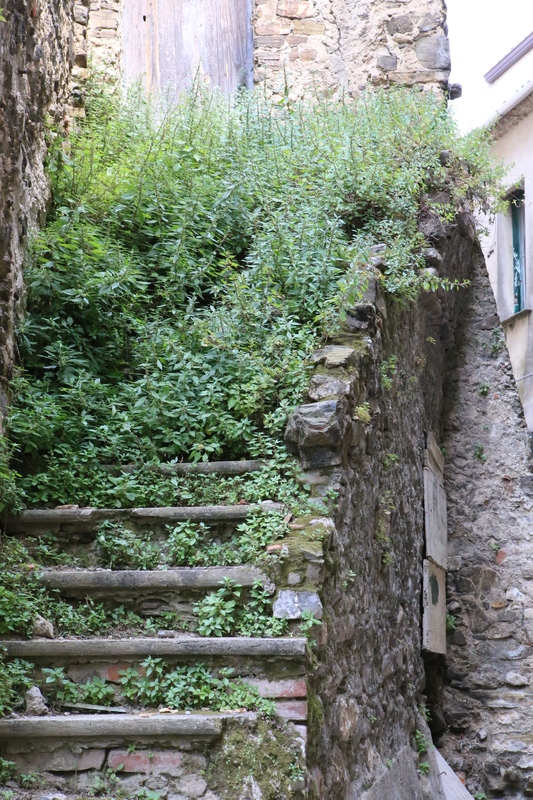 You don’t have to be in Positano to find stairs. Italians love them. It is what keeps them in shape as they walk their cities (passeggiata). It appeals to my sense of adventure to follow these small streets. I love to find out where they go. I also love just getting lost on my small adventures. Don’t worry, we have modern technology in our pockets that can GPS us back to our cars or hotels. I think getting lost is a primordial need we all have. Just give in an do it. You know you want to find out where that street goes to. 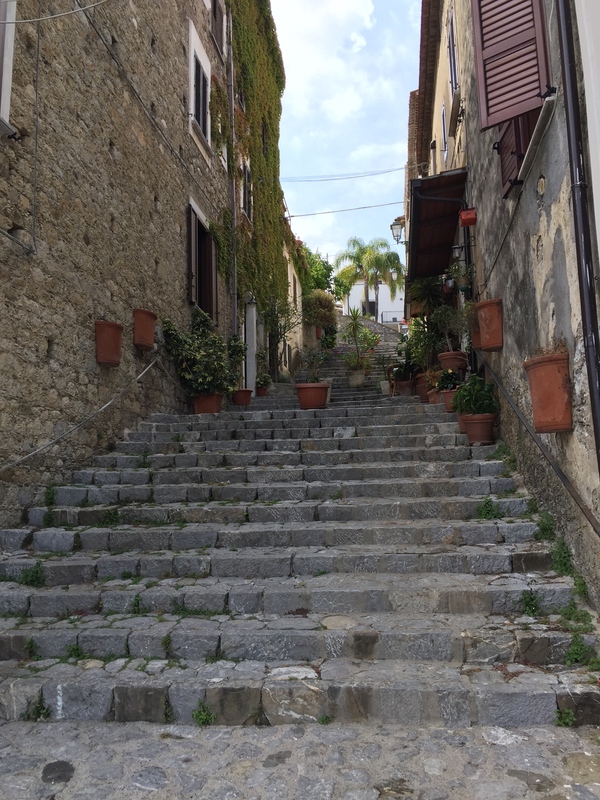 I have been in small towns where most of the streets are stairs. You climb and climb until you get to the top. There you usually find a church or a castle. No matter how small a town you are in, you will always find a bar. You can stop for a cafè, drink or sandwich. This is Italy. This is how life is lived. Enjoy it! Along your adventure look at the doors, the windows and the laundry. It is colorful and photogenic. There is always a new surprise just around the next bend. Discover it. 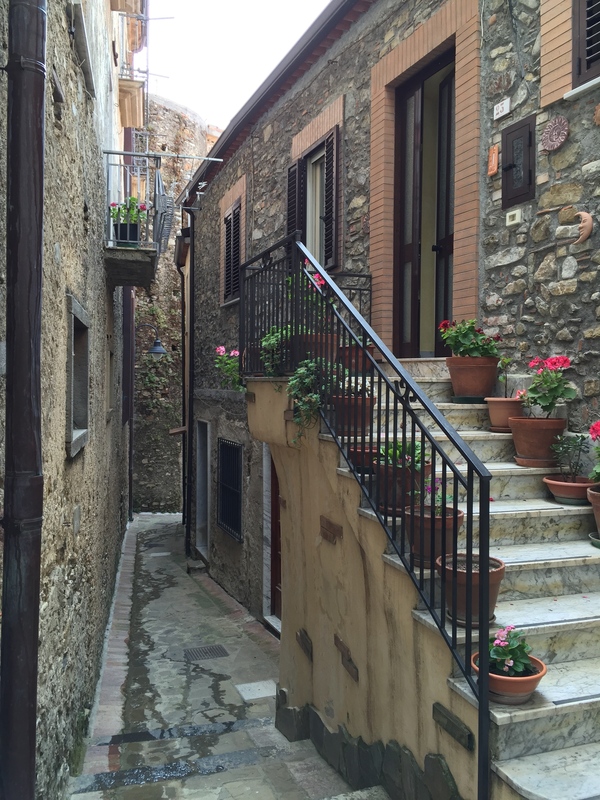 As most of you know Jo Anne has been working on a much need BLOG about Southern Italy and in particular southern Campania called Mezzogiorno Living. My BLOG, Travel in Italy BLOG, is still about traveling in Europe and in particular Italy. 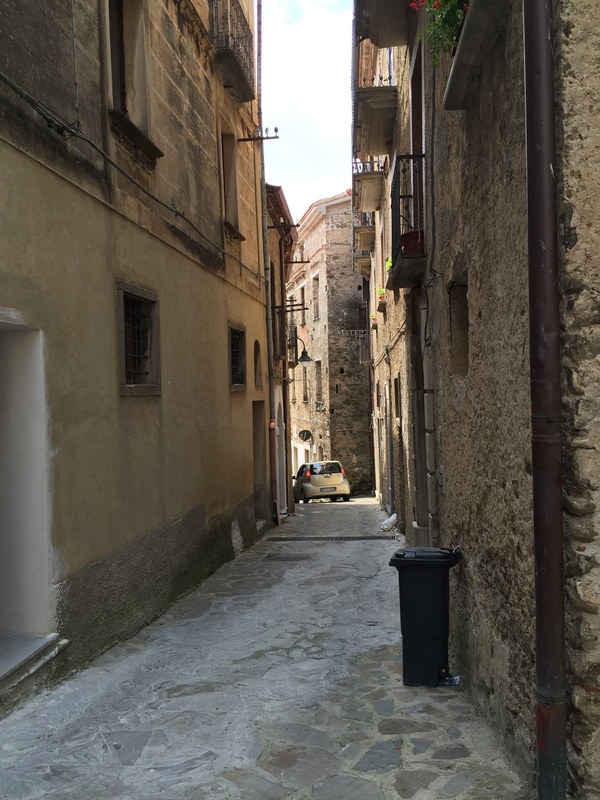 These both BLOGs together will give you a high level view, in my BLOG, and a drilled down detail view of southern Italy, in Jo’s BLOG. I will be discussing all the places in Europe we travel with emphasis on Italy. Italy is special to both of us. Jo will be discussing what to do in southern Italy. Her BLOG is both a website and a BLOG. Her home page is a regular BLOG with her last BLOG on the top. The sidebar on the right side has a SEARCH box to find anything you are looking for. It searches all BLOGs as well as all her menu pages. Her menus look at stores, restaurants, beaches, towns etc in Southern Italy. On a smart phone the menu is gotten to by clicking the bars in the upper left hand corner. Each menu may have sub-menus that will take you to pages of information. You will find addresses, phone numbers, links to websites and Trip Advisor links. When we bought in this area, we had a hard time find local restaurants, supermarkets, stores and interesting towns to visit. I wish we had this site when we were first visiting this area. I hope both sites help you with information and travel in Europe and in Italy. Buon Viaggio! How can I survive without a Tour? YES, YES, YES!!!! You really can survive very well without a large formal tour. Huge bus tours stop at restaurants that make food for a large number of people quickly. This is not the Italian way. They also can not get you into small mountain towns. 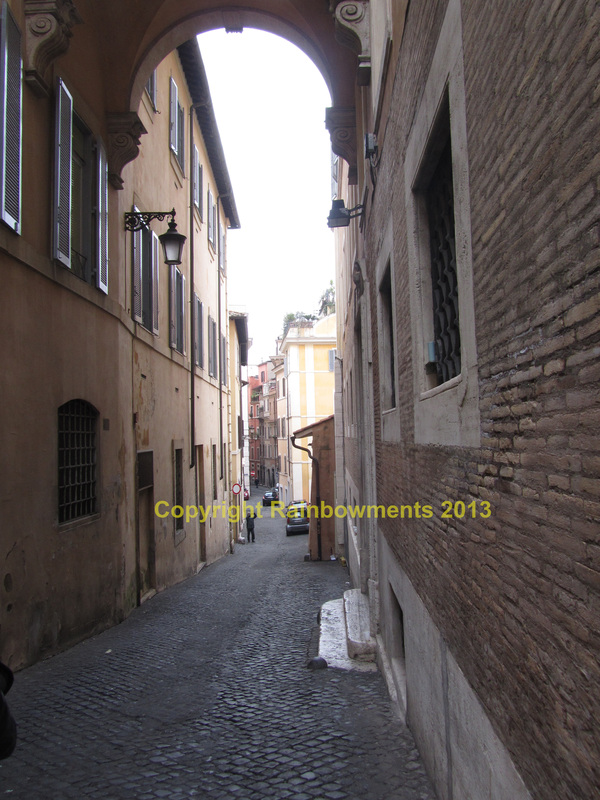 The roads are to steep and narrow. Hard to plan and I am not a planner – Planning today with the internet and smart phones is easy. GPS will prevent you from getting lost. I might miss something important – There are great guide books and Apps that will tell you about the top 10-20 things in a city. You can not miss anything important. They will also guide you through museums, castles and churches. I don’t speak the language – Large modern cities have many people that cater to tourists and can speak some English. When you speak, speak slowly and use basic English like you where talking to a child. Learn the basics like Hello, Good morning, please, thank you and how much is it. I might get lost – As we said use a GPS App on your smart phone to get you around. If you don’t have one, rent one. I am afraid to find my way around – This is pure fear … FIGHT IT! You can get around and you will find great things to see, great restaurants to eat at and meet very friendly people. Don’t eat at tourist restaurants or near tourist attractions. The food is for tourists not locals. Get out with the locals and go to their restaurants. You will be amazed at how good the food is. Number 1 & 2 above – trips are not hard to plan. Buy a tour book at Amazon or Barnes & Noble. These books show top attractions and top things inside these attractions. You really can not miss anything important. With a map or a smart phone, you can layout where all of the attractions you want to see are. How far apart they are. You can plan what you can do each day. Next decide if you will walk, take a taxi or public transportation. Taxi drivers speak enough english to get by. Buses and Metros are easy to find and travel on. In big cities there usually is a metro stop near every major attraction. There are smart phone apps that determine where you are (GPS) and tell you where nearest metro stop is. They even guide you as you walk. Once at the metro they tell you what train to get on, which direction to go, how many stops to yours and the name of your stop. Once off the train they once again guide your walk to your attraction. Number 3 above – English is the universal language, French speak english in Italy, Japanese speak English throughout Europe. Most big cities have people who know enough English to help you. Attractions hire people who speak english as well. We like to learn some words in the country’s language we am visiting. They feel good when we try to speak their language. Number 4 & 5 above – You really can’t get lost with a good map or better yet a smart phone. Smart phones are getting cheaper each year. Plans for foreign use are cheaper than ever and at least one company is offering free foreign usage. You really need a data plan so you can use the internet. Many apps require communication with a server on the net. Map apps show you where you are and how to get to another destination like your hotel or the next attraction you want to visit. You never have to be afraid of getting around again. Be polite and kind to other people you encounter. You are their guests. They are NOT your servants. If you are friendly and nice most people will return the same to you. Exchange your money at banks not airports! Check rates they vary a lot. Use credit cards to get cash or purchase items. They charge a slightly higher exchange rate and most today do not charge extra foreign fees. Most important is just relax and enjoy your adventure. Eat and enjoy the food, drink the wine, speak to the local people and see the sights. Take plenty of pictures and you will create a memory you will never forget. Most important be romantic, live like a European and enjoy yourself. You can do it! Europe has such small and romantic streets. They are lined with stores and restaurants and yes peddlers. Some are so narrow you can only get a very small car through. 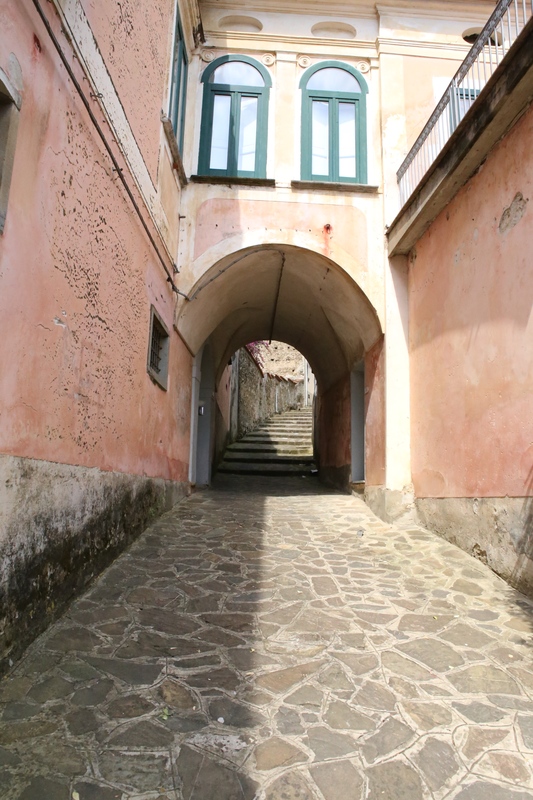 George was following a friend in Italy and came to a very narrow passage. He had to back up and go another way. If he continued he would have been wedged between two walls with no way out. 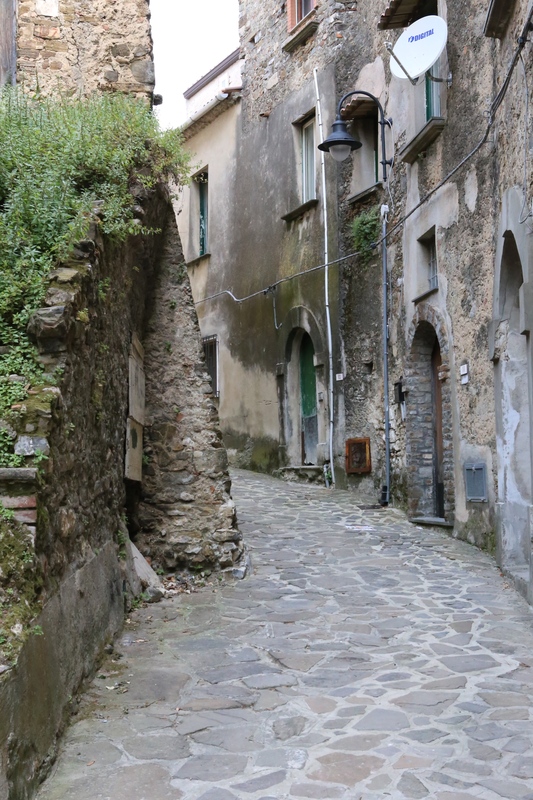 These streets can be cobble stones or paved, tiles or stairs (as in Positano) but they all offer an adventure. Walk them, meet some people, eat in the non touristy restaurants with the locals and shop in the small non touristy shops. Smart phones are amazing as guides. We use our iPhone GPS in walk mode to find our way out of a maze and back to a known area or our hotel. If you familiarize yourself with a city map and place major monuments on it, you will not get lost. Your smart phone can help you in a pinch. The European Metro’s (subways) are safe and easy to use. There are Metro apps for your smartphones on most major cities. Some of them let you enter a destination and they know where you currently are. They can then show you where the nearest Metro stop is and which trains to take to get to your destination. Tom-Tom GPS – This is a great GPS program that doesn’t use Internet (unless you are looking up a place by name). We bought the Western Europe version for $50. We have had it since our iPhone 4s and we both share it for the one cost. Airline Apps – Most airlines have apps to check-in, check on flights and book new reservations. They also usually work with the iPhones Passport. You can show your phone at check-in and security instead of paper. My TSA – Is an app that has the latest TSA rules and regulations. Expedia, Orbitz, Trip Advisor, etc. – These apps give you access to hotels, cars and flights from anywhere in the world. GateGuru – Shows gates at many large airports and what stores and restaurants are nearby. Language Apps – These allow you to translate languages in either direction. This can be handy in a country that you don’t speak the language. There are also apps that allow you to take a picture from your camera or the Internet and translate the foreign text. Vino Volo – If your airport has a Vino Volo, it is a great place to start your vacation. Have a glass of wine and something to eat. The app gets you free membership which gives free sampling. If you get lost just use your map app and plug-in your hotel address (get a card as you leave your hotel). Make sure you have it set to walk not drive (unless you are driving) and get instructions back to your hotel. You can use this to find museums, monuments and gardens as well or just an interesting restaurant. The subway apps are fantastic. We used the Paris Metro App to find the nearest metro stop to where we were and then to plot a course on the metro to where we wanted to go. It tells you which direction to take train, how many stops to go, which trains to switch to and your final stop. The map app can then pick up from the metro stop to your destination. Your smart phone becomes your European guide-book but so much more powerful than any book could be. Many apps offer a guided tour through a museum or monument. Make sure you bring your headphones. What did we do before smart phones? Paper maps were so hard to use!